Tron is a blockchain platform that focuses primarily on building the foundation of a global decentralized entertainment, media, and content market. This will allow Tron creatives and users to cut out middlemen like the Apple App Store, Google Play Store, and with the gradual incorporation of gaming, platforms like PlayStation Network as well. The Tron blockchain uses a Delegated Proof of Stake (DPoS) governance model to achieve consensus on any changes that need to be made to the Tron network. This is also how TRX holders can vote for “witnesses” who are responsible for keeping the network running smoothly and compensated for processing transactions. There is already a plethora of dApps for Tron users to enjoy, and the company currently boasts the title of largest decentralized network in the world after acquiring p2p leader BitTorrent. Tron has a classic three-layer architecture that enables it to maintain decentralized governance and manage cost-efficient, fast transactions between users. There is the storage layer, which handles how data is recorded in blocks on the chain and how it’s recalled for fast processing and future upgrades. The core layer deals with the various functionalities of Tron, including modules that enable smart contracts, account management, voting and consensus. The core layer also incorporates Tron’s virtual machine, which expands the programmatic languages that developers can use to create dApps. Finally, the application layer sits atop the previous two, and makes it possible for developers to create their own smart contracts, dApps, and accompanying tokens on the Tron blockchain. As for the roles in the Tron ecosystem, the brunt of the work is borne by 27 Super Representatives (SR), who are voted for by TRX holders, and the rest of the community can help these nodes and potentially earn TRX (if that’s part of the SR’s pitch). Voting for SRs is happening constantly, because the Tron community is very careful to maintain an environment that is inexpensive to transact in and fast. To get started using Tron, you’ll first need to establish what capacity you’d like to interact with its network. Holding TRX is the easiest way to participate from the get-go, and being a TRX holder gives you certain privileges, such as the ability to engage with dApps on the Tron network, voting on delegates, and proposing changes to Tron’s protocol. Developers seeking a presence on the Tron blockchain will uncover a multitude of resources at their disposal as well. 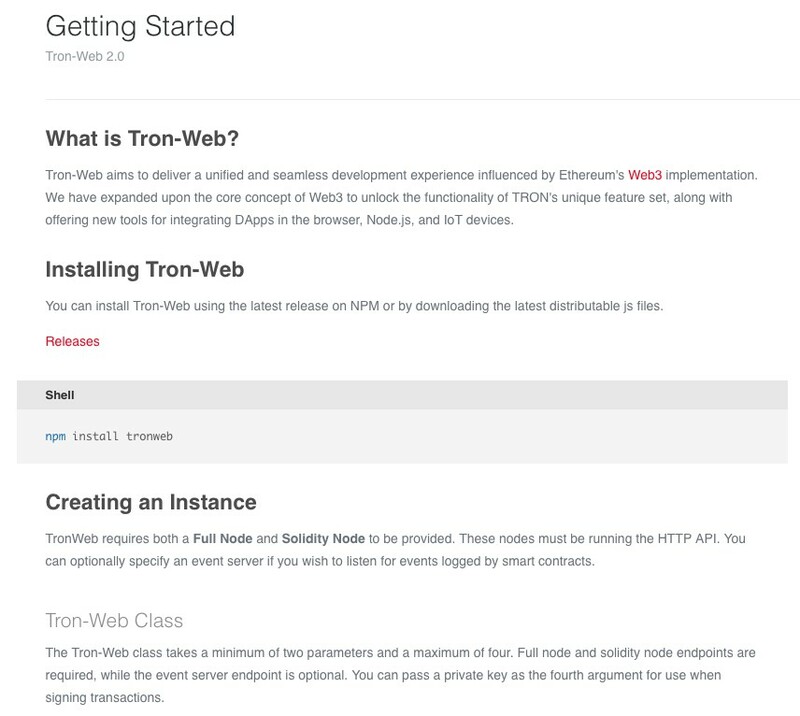 There are repositories of developer resources available on many websites around the net, and Tron produces its own guides available as well. Regardless of what you want to accomplish with Tron, the first step is conducting due diligence on how it works, and that means buying and using TRX. 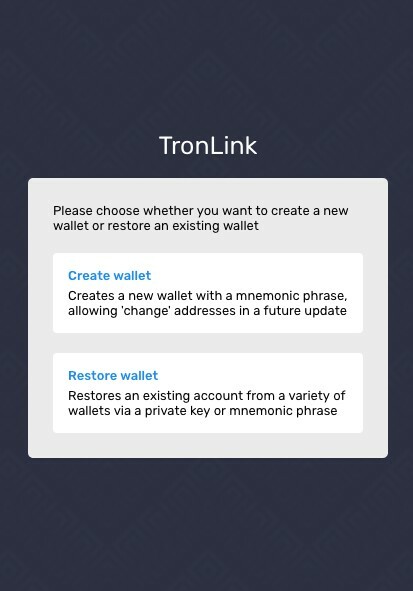 Setting up a TRX wallet is an easy exercise and can be done via any of the links on Tron’s own website. 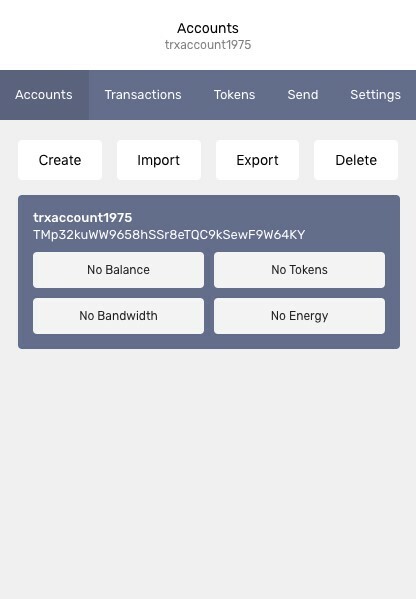 Navigate to the Wallet page to view all the community-sourced wallets built to hold TRX exclusively, but also the broad multicurrency wallets like Ledger which hold TRX and multiple other coins as well. 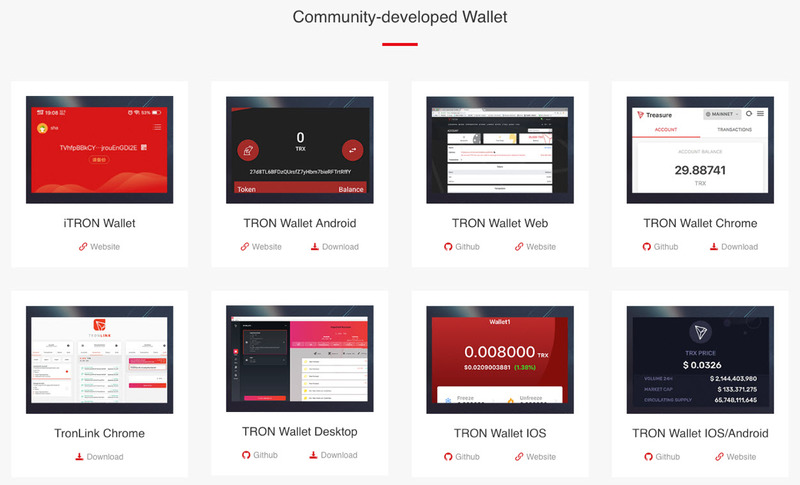 Users can choose from TRX wallets like the iTRON Wallet, TronLink Chrome, or TRON Wallet iOS, but also popular multi-coin wallets like Trust Wallet, Exodus, and the popular hardware wallet Ledger Nano S. These are all TRX wallets that can be deployed safely from anywhere: your desktop, an internet browser, a mobile device, and even a USB-stick-like hard wallet device. Developers on Tron can create their own wallet software to connect with the Tron Block Explorer, but only those that have been approved are listed. Click on the Download link under the panel displaying TronLink Chrome. 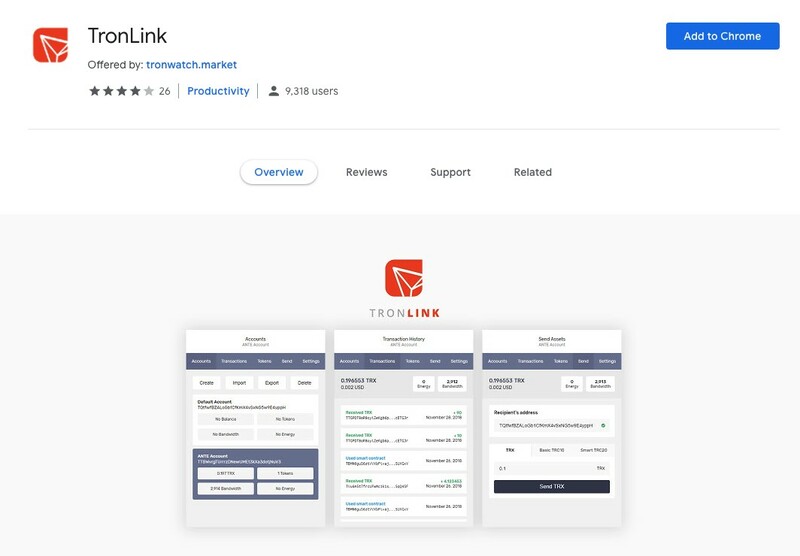 TronLink is an extension for the Chrome browser. On the page that you’re redirected to, click on the blue Add to Chrome button. The TronLink icon will now display on the extensions bar of your Chrome browser. 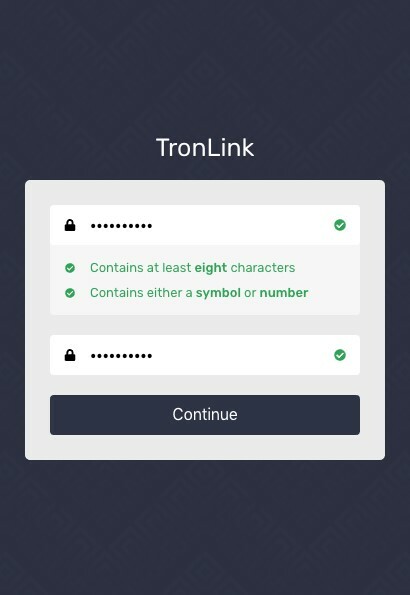 Clicking on the icon will open the TronLink popup and prompt new users to create a strong password. Pick a password and type it twice for confirmation. You’ll be asked to restore an existing TRX wallet or create a new one. To restore, you’ll be prompted to enter your secret key or phrase. We’ll create a new wallet by clicking Create Wallet. Create a username based on the conventions listed in the following popup, and then write down the 12-word phrase displayed. This is your secret phrase that can be used to restore your account. 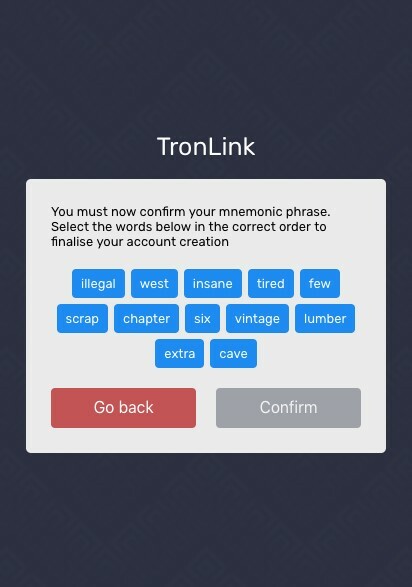 TronLink will ask you to click on the words that appear, in the order specified by your key phrase to confirm and finish setting up the wallet. Now when you click on the TronLink icon in Chrome, you’ll see a popup that lists your account(s), associated wallet addresses, past transactions, different Tron dApp token balances, and more. rganized, full-stack blockchain infrastructure platforms, Tron has a block explorer tool called TronScan that allows users to look up individual blocks, transactions, and addresses on the Tron network. It efficiently translates the data that the blockchain maintains into multiple languages and can deliver insights into how TRX moves through the ecosystem, the status of individual transactions, usage data on dApps, and more. Besides analysis purposes, TronScan is also how one can find a Super Representative node in the Tron network, which is responsible for processing transactions. One can create their own node to supplement the efforts of these nodes and depending on the custom payment structure of this node, obtain rewards for assisting. The DPoS system logically incentivizes SR nodes to share the wealth with their support nodes or else they wouldn’t receive votes from the outset. On https://tronscan.org/ click on the Blockchain tab on the left side of the top menu. In the dropdown menu, click on Nodes. 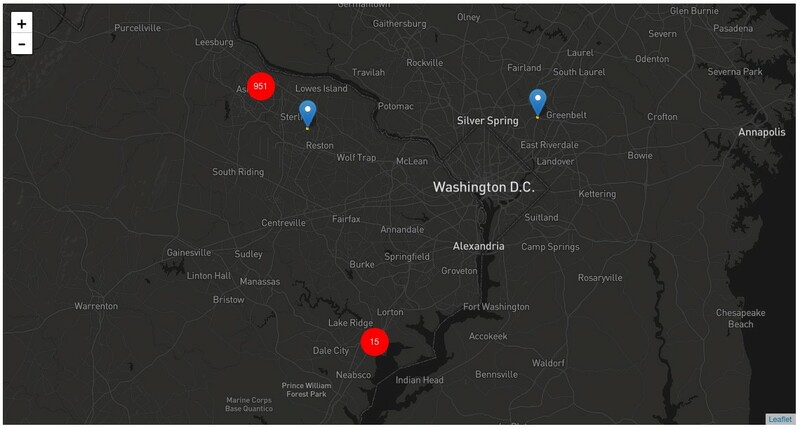 You’ll see a map where you can zoom in to find the Tron nodes and SR nodes nearest to you, which will come in handy when you determine which SR to vote for and connect with. You can also click on the pins on the map to see the IP address of the respective node. Search this address in the sitewide search bar at the top of the page to reveal more data about the node, such as the number of coins the node holds, the number of transactions it’s completed, uptime, efficiency and more. TRX is a popular altcoin that’s listed on many exchanges, thanks to the ceaseless efforts of the Tron team and CEO Justin Sun. There are well over 140 exchanges that list TRX, including platforms like Binance, Upbit, OKEx, Huobi and more. These are all crypto-to-crypto exchanges. Unfortunately, there is no way to buy TRX with fiat directly, so those who don’t already have cryptocurrency to exchange for TRX will need to sign up, verify, and link their bank account or credit card to a fiat exchange first. Those like Coinbase, Kraken, or Gemini are reliable and safe places to get started. With BTC “in hand”, sign up for an exchange like Binance, which lists TRX against popular counter currencies including BTC and ETH. After verifying, navigate to your Wallets page on the exchange and find the BTC wallet. Click on Deposit. The exchange will generate a BTC deposit address, which you can then copy to your clipboard. Go to the exchange where your BTC is, find your wallet and click Withdraw. 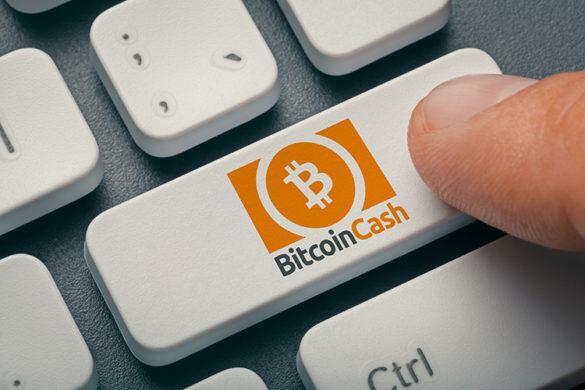 Paste the BTC deposit address into the field here and click Send. You may need to confirm the transaction with your 2FA device before sending. The BTC will take anywhere from 10-30 minutes to hit your new wallet, and after it does, click on the TRX/BTC pair. 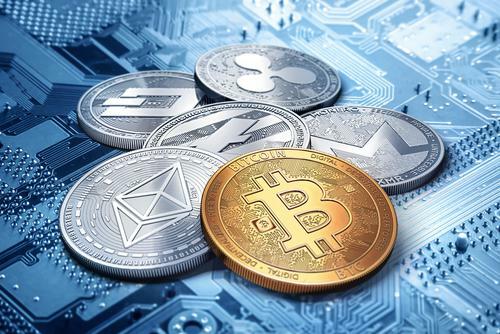 Many exchanges have the counter-currencies listed at the top of the market, so if you click on BTC you’ll see all the available altcoins denominated in BTC. Click Buy TRX and input the amount of BTC you want to exchange for TRX. Click Buy and that’s it! Ambitious developers seeking to construct their next decentralized application on the Tron blockchain have many resources at their disposal. The biggest online information hub is available at https://developers.tron.network. Here, you’ll find most of the answers to your development-centric questions and can also talk with other Tron devs. Recently, Tron expanded from Java exclusivity, with the Tron Virtual Machine now making it easier to develop in any programmatic language—just like Ethereum. 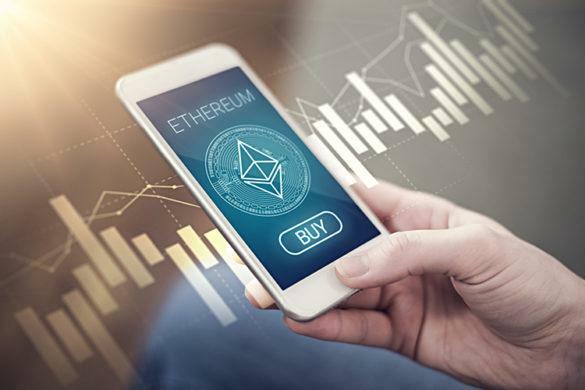 Many developers will choose to make a standalone app or build one on Ethereum using the plethora of resources available to ETH devs. The two blockchains are very similar and work well together, so it’s easy to take a dApp designed to run on ETH and then simply integrate Tron later. It may also be more practical. In terms of tools, go download a Solidity compiler or use a website that does it for you. You also need to download Node.js and have a compatible operating system. Finally, to collaborate and share with other Tron devs, Yarn comes highly recommended and is available for free. Participating in Tron’s high-turnover Super Representatives votes is one of the best parts about being a TRX holder. TRX, when “frozen” generates a gas-type cryptocurrency called POWER, which is what TRX holders use to cast their votes. Locked TRX can be unlocked and recovered, so those worrying about freezing their precious coins and losing them after voting can be reassured. Go to TronScan and login. Ensure that your Tron wallet has at least 1 TRX in it. Without TRX you cannot vote. If your wallet isn’t yet connected to TronScan then click on Open Wallet in the top right, and then input your wallet’s private key. 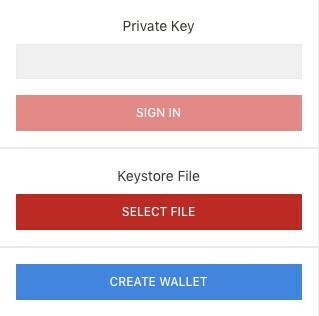 If you have the wallet’s keystore file on your computer, it can also be imported this way. 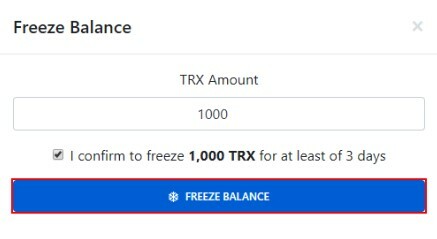 In your wallet, click the Freeze button to select how many TRX you’d like to freeze. They’re only locked for 3 days, during which time they’re unable to be traded. After the 3-day period has expired, your TRX is restored. Go to the Tron SR tab on TronScan and click on Votes. You’ll see your balance of Power, TRX, and a timer showing when the next round of voting begins. There can only be 27 SRs at one time. This page also lists the current SRs and their own pages, where they list their reward distribution rate to helper nodes, members of the team and more. Click ‘Click Here to Start Voting’ to make a slider appear next to each SR and each candidate, which you can use to select how much of your POWER you want to vote with, and for who. After voting, your balances will refresh and if your SR is voted in (or remains an SR), you can support their node and begin reaping the benefits of the Tron ecosystem for yourself.